We’re celebrating our 125th anniversary as a Chicago school in the 2018-2019 school year! Ravenswood (viewed from the south) in 2018. Many features of original building still remain. Our school building is one of the oldest in the city! Ravenswood School is celebrating its 125th Anniversary this year! Please join our celebration at our Spring Forward Benefit, connect with alumni and friends, and support our school as we get ready for another 125 successful years! Ravenswood School has been a part of the Ravenswood community since 1873, when Ravenswood was a subdivision of the Chicago suburb of Lake View, and was sending about 50 commuters into the city each day on the train. The community was originally designed as an exclusive commuter suburb, with large lots for sale and houses built farther back from the street for an aesthetically pleasing appearance. The community needed a schoolhouse for all its children, so the construction of Ravenswood School, originally called Sulzer Street School (Montrose Avenue was formerly called Sulzer), began at a cost of about $15,000. This makes Ravenswood School one of the oldest elementary school buildings in the city of Chicago! 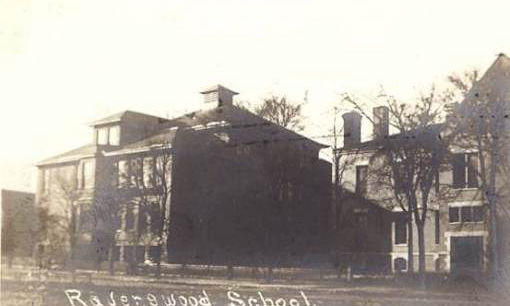 In 1889, Ravenswood was annexed into the city of Chicago, and in 1893, a 12-room addition was made to the school and the name was changed to Ravenswood School. Land that must now be part of the south playground area was acquired in 1910, and was added in 1923. The two wings on the north and south sides of the Ravenswood School were added in 1912 and 1913, adding twelve rooms and many stairs. These stairs became a point of contention much later in the 1970’s when parents and the school council complained that they made much of the space unusable and turned down $500,000 in rehabilitation work, because they said the stairs would make the work impossible. Hard to believe in today’s world of underfunded schools! In 1929, Ravenswood School’s junior high students were moved to Stockton School, which was then a junior high school. Because there was unused space at Ravenswood School, Lakeview High School used the space for their freshman students. At some point later in the 1930’s, the junior high classes were brought back to Ravenswood School. For a more detailed history, please see Elizabeth Patterson’s overview of our historic schoolhouse.